If you get in over your head in debt and the bills continue to pile up, you may wonder if filing bankruptcy is the way to go. Under Kansas law, bankruptcy is meant to be a last-resort option. It isn’t a cure-all for all financial ills. However, there are situations where bankruptcy can provide a much-needed fresh start or more breathing room to get finances under control. Here’s what you need to know about filing for bankruptcy in Kansas. First, what are the types of bankruptcy for individuals in Kansas? A chapter 7 bankruptcy, or “straight bankruptcy,” liquidates (sells) your assets to pay off as much of your debt as possible. Under Kansas law, there are types of property that are exempt from this liquidation up to a certain amount. These can include a primary residence, a vehicle that is used to commute to work, and certain insurance policies and benefits. A bankruptcy attorney can help you understand these Kansas bankruptcy exemptions so you know exactly what’s at stake. The debt that remains after liquidation is discharged, though there are exceptions—those will be covered in a bit. Common reasons for filing chapter 7 bankruptcy include large medical bills, extended unemployment, and overextended credit. Keep in mind that a chapter 7 bankruptcy doesn’t cancel the rights of creditors who hold secured loans, like a mortgage or car loan. They still have the right to take the property to cover the debt if you’re behind on payments. A chapter 13 bankruptcy, or “reorganization bankruptcy,” adjusts your debt using a repayment plan. Debt is paid off over a period of three to five years, and if the terms are kept, the debt remaining is discharged (also with exceptions). It’s commonly used when people have a steady income and want to keep their non-exempt property, but need some “breathing room” to pay back outstanding debts or avoid foreclosure. To file a chapter 7 bankruptcy in Kansas, you must have an income below the Kansas median for your household size, or else pass the Kansas means test. This is used to determine if you are able to repay part of your unsecured debt through a chapter 13 bankruptcy instead. There are some exceptions to the means test requirement, that have to do with the type of debt you have and how it was incurred. There are income requirements for chapter 13 bankruptcy, too. To be able to file, you must have a regular source of income, as well as disposable income, to apply towards your repayment plan. Remember that just because you qualify for one type of bankruptcy or another, doesn’t mean it’s always the right choice. It’s wise to consult a lawyer to help determine to best option. What types of debt can’t be discharged by filing bankruptcy in Kansas? These apply to both chapter 7 and chapter 13 bankruptcies in Kansas. You must also continue to pay secured debts (like a mortgage or car payment) if you want to keep the property. In chapter 7 bankruptcies, a judge may rule certain types of debt non-dischargeable if they are challenged by the creditor. These can include credit purchases of luxury goods within 60 days of filing, loans or cash advances of $1,150 or more within 60 days of filing, debts incurred through illegal activity, and certain debts owed under a divorce decree. What are the pros and cons of filing bankruptcy in Kansas? A bankruptcy can negatively impact your credit score (though it may already be low due to late and missed payments). A chapter 7 bankruptcy stays on your credit report for 10 years, and a chapter 13 bankruptcy for 7 years. A bankruptcy will not eliminate the debt for co-signers on a loan. They may still have to pay all or part of the debt. There is no one right answer to this question. Every financial situation is unique, and you should seek the help of a professional to understand your options. Still, here are some basic indicators that it may be time consider filing bankruptcy. You’ve exhausted your other options. Bankruptcy is a last resort. If you’re able to reduce your debt or work out an acceptable payment plan with your creditors, that’s favorable to filing bankruptcy. Options to explore include negotiation, credit counseling, credit card consolidation, loan modification and loan refinancing. If these fail to provide a path out of debt, it may be time to consider bankruptcy. You’re being sued by debt collectors. If your debt has been turned over to a collection agency, and their calls and letters go unanswered, they may file a lawsuit to try to get the money. If you lose the lawsuit, you may end up owing court costs and attorney fees on top of the debt. Filing a bankruptcy petition holds off additional collection actions, including lawsuits, until the bankruptcy is either discharged or dismissed. You owe more money than you can possibly afford to pay. Maybe it was due to extended and continuing unemployment, or large medical bills from a major illness or injury. 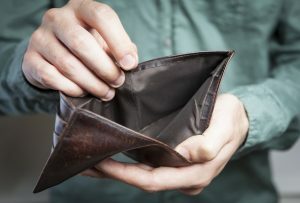 If there is simply no way you’ll have enough income or assets to pay back your debt, bankruptcy may be the best option. You’re facing foreclosure. In a chapter 13 bankruptcy, you can prevent a foreclosure if you’ve paid off the outstanding balance on your mortgage at the end of the chapter 13 repayment term, and continue to make your regular payments going forward. If you’re considering bankruptcy, you don’t have to figure it out on your own. It’s important to understand your options. Morris Laing’s bankruptcy attorneys in Wichita, Kansas can help. We are a debt relief agency. We help people file for bankruptcy relief under the Bankruptcy Code. Contact us today at (316) 262-2671. This site contains Attorney Advertising. The information on this website does not constitute legal advice. The posting of this information does not constitute an offer of legal representation, and accessing such information does not create an attorney-client relationship. E-mails sent to the addresses provided on this website are not considered confidential. Do not send confidential information to us without first contacting one of our attorneys. Unless otherwise noted, our attorneys are only licensed to practice in Kansas. This website should not be construed as advertising or solicitation to perform legal services in any jurisdiction where we are not licensed to practice law. The results or outcomes of cases listed on this site do not guarantee a similar outcome in future cases.